A recipe for traditional Greek spicy meatballs in tomato sauce. It’s the world famous and popular Soutzoukakia. Everyone has his favorite comfort food made by the magic hands of his mother. Mine, and a few millions of others, is the delicious meatballs in a rich tomato sauce coming by the funny name Soutzoukakia. Soutzoukakia, as the name reveals, has an eastern origin. You can recognize the word “Sujuk” hidden in there, which describes a sausage-like delicacy in Turkey, Middle East and the Balkans. 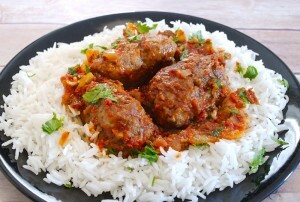 Here, we are not dealing with sausages but rather with spicy meatballs. Soutzoukakia came to the mainland of Greece in the last century, after the terrible events with the exchange of populations between the Turks and Greeks. The Greeks living in Turkey brought with them their culinary traditions, especially all the lovely spices and herbs they were used to cook with. They key for successful Soutzoukakia is the right portion of spices and herbs. Cumin is a must and should be abundant. A touch of nutmeg and ground cinnamon gives an extra kick but they should be used with moderation, especially cinnamon, as they are extremely strong and can ruin your food. They should be soft so plenty of bread is necessary. A touch of an anise-based liquor (like Ouzo) brings it to another level. 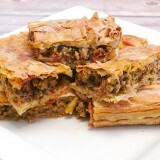 The Greeks usually make their Soutzoukakia with veal, sometimes a blend of veal with pork. The combination may sound strange but it actually works quite well. If you can’t find mince veal easily, you can use beef of course. 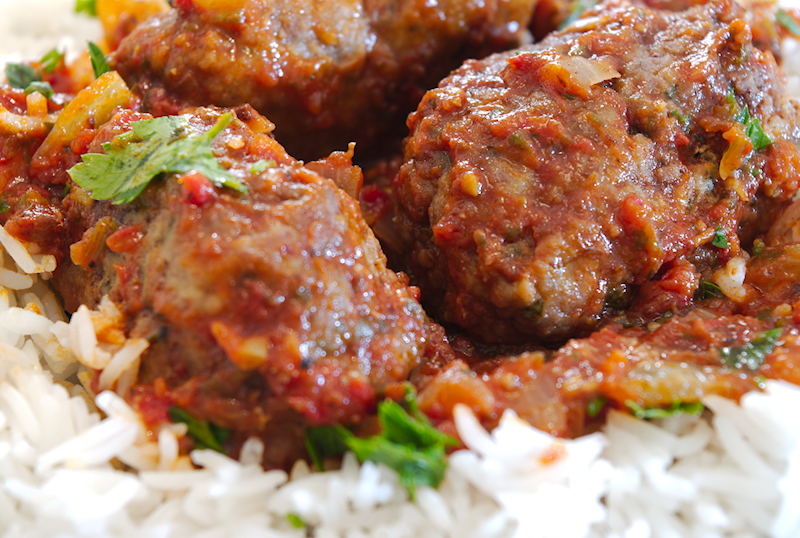 At the end, you should have soft and very aromatic meatballs. A nice tomato sauce completes Soutzoukakia. I am always using fresh tomatoes together with concentrated paste when I make tomato sauces.. It really breaks the bitterness of the tomatoes in a tin can, which I hate. If you are blessed and you are living in a country where tomatoes are juicy, sweat and full of flavor you can skip the concentrated ones and use only fresh. That’s the real way to do it. 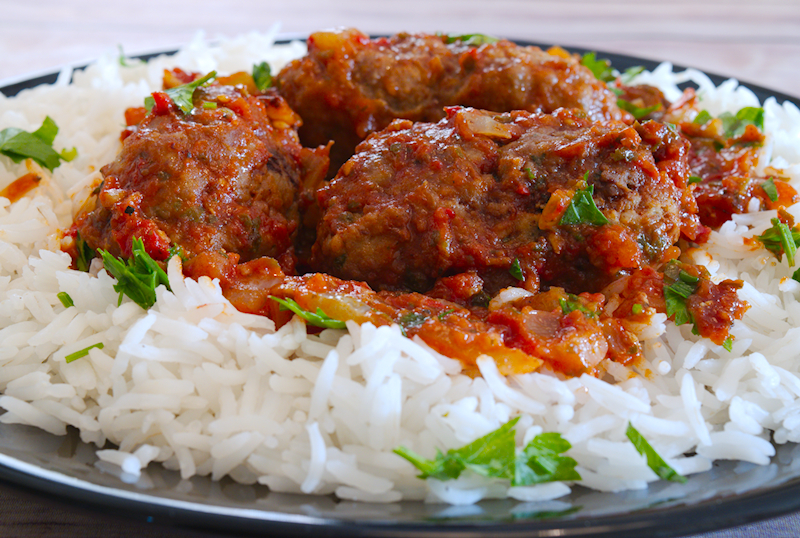 A recipe for traditional Greek spicy meatballs in tomato sauce. It's the world famous and popular Soutzoukakia. 500 gr (17 oz) mince veal. 500 gr (17 oz) mince pork. 5-6 slices of toast bread. 2 shots of Ouzo or Raki. 50 ml (1.7 fl oz) extra virgin olive oil. 1 ½ bunches (~ 75 gr, 2.5 oz) of flat-leaf parsley. 1 ½ tablespoons ground cumin. 1 ½ tablespoons of salt. 3-4 large ripe and sweet tomatoes. 50 gr (1.7 oz) all-purpose flour. 300 ml (10 fl oz) sunflower or vegetable oil for frying. 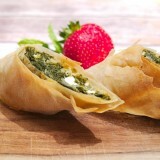 Add the olive oil, 4 garlic cloves, one bunch of parsley and mint in a food processor and create a nice paste. Add the paste into a large bowl together with the eggs, Ouzo and spices. Whisk the mixture well. Add the bread and knead well until you have a homogeneous mixture. 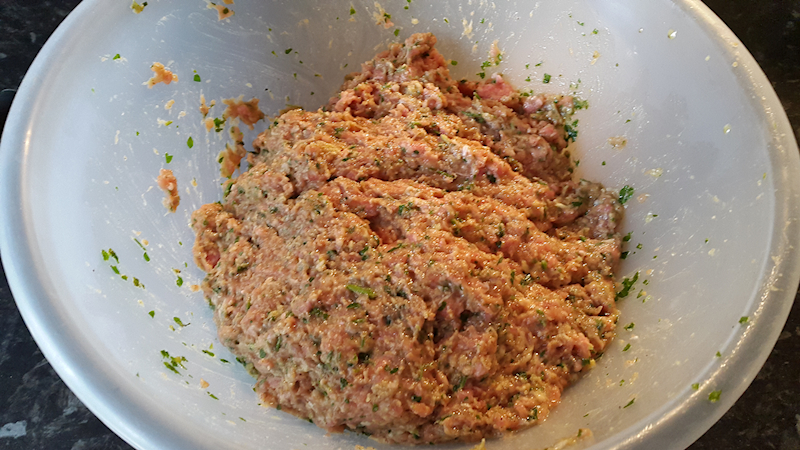 Introduce the meats into the bowl and knead well for a couple of minutes so all of the ingredients are mixed well. Let it rest for ~ 30 minutes in the fridge. 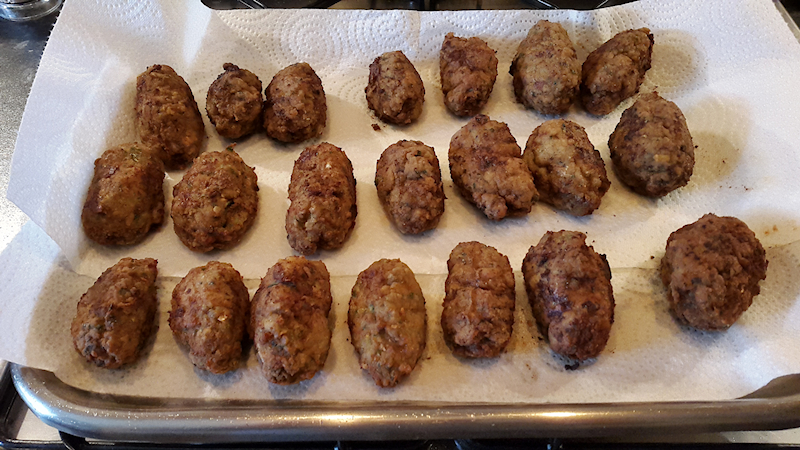 Take a small ball of the mixture and create an elongated but not too thick meatball. Cover with flower and set aside. Repeat for the rest of the meatballs. Heat up the sunflower oil in a large frying pan on medium-high heat. 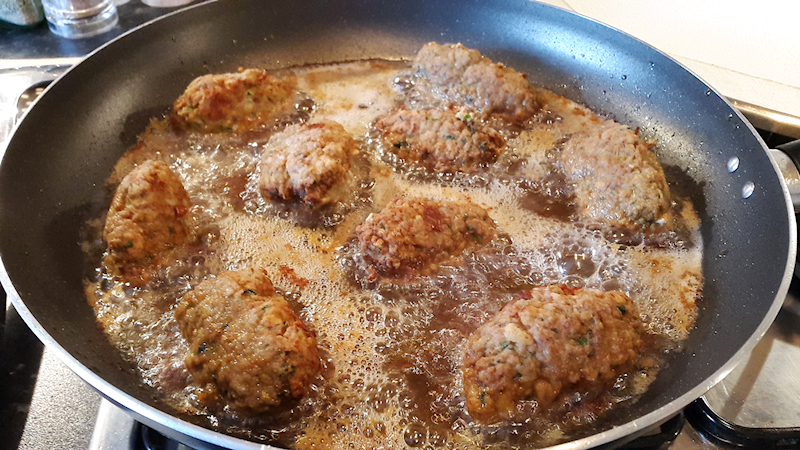 When the oil is hot add the meatballs and fry them until they get evenly brown. When ready, put them on a tray which is covered by paper towel to absorb the excess oil. Add the tomatoes, 2 garlic cloves and the rest of the parsley in a food processor to create a nice paste. In a large frying pan or deep pot add 4-5 tablespoons of olive oil on medium heat. Add the onion and cook until it starts getting brown. Add the paste from the blender, the passata, the oregano and season with salt and pepper. You can add a bit of paprika and chili powder if you like. Give it a good stir, change the heat to low and let it cook for ~ 10 minutes. 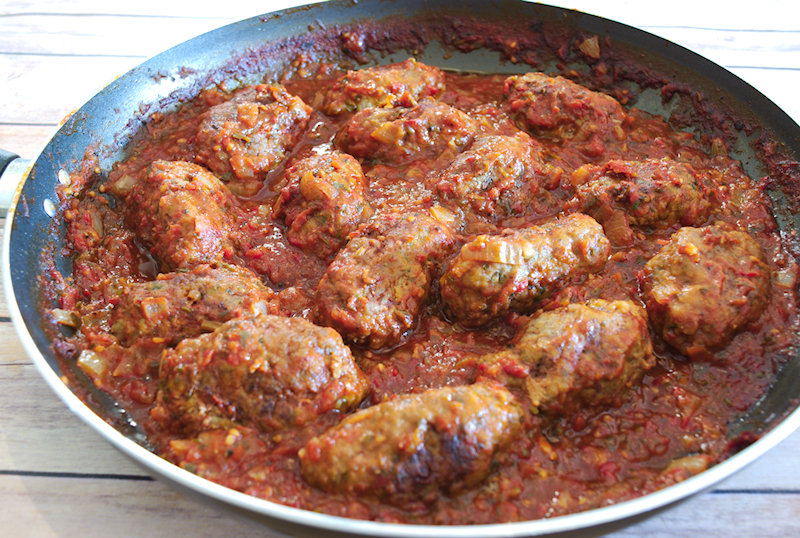 When the sauce starts to thicken, introduce the meatballs in the pan or pot and cover with a lid. Let the Soutzoukakia simmer for ~ 15 minutes while giving an occasional stir. 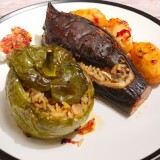 Enjoy you Soutzoukakia with Basmati rice of mashed potatoes.